We have created a New Product Development Solution that can significantly enhance your business. If you are using a stage & gate process now, we can dramatically improve your performance and profitability—you don’t have to change your process or your documents! 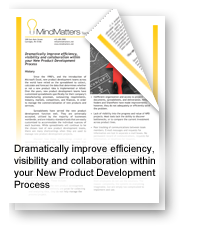 If you are seeking assistance developing a new product development process, MindMatters Solutions can help! We have a team of New Product Development professionals with years of experience that can help you design a new product development stage & gate process for your business. We also offer a Stage & Gate New Product Development Process Template that can be modified to work in almost any industry, saving you tens of thousands of dollars in development time and resources. Once you experience our solution – INNOVATOR NPD Express, you will discover methods to improve your current new product development process in ways you never imagined! Discovery – Grow your new product development pipeline – target your innovation efforts toward the products, markets and services that generate the greatest ROI. Stage & Gate New Product Development – Automate your stage & gate new product development process to increase speed-to-market while providing instant progress and ROI updates to management. Uncover new market and product opportunities. Challenge your employees to continuously grow your innovation and new product development pipeline. Allow collaboration to enhance and strengthen the best ideas. Review, analyze, and move the best ideas forward for implementation. One click of the mouse turns approved new product ideas into stage & gate new product development projects utilizing our integrated StageTrak solution. Discover new market and product opportunities delivering the greatest ROI. Organize, classify and group ideas for easy review and disposition. Create an idea repository for automated searching and locating/linking of similar and complementary ideas. Evaluate the progress and success of your program with many standard management reports. Easily convert approved ideas into StageTrak for further stage and gate evaluation and implementation. Making the right decisions on the best new projects is critical. At the same time, speed-to-market can make or break a new product introduction. Optimizing your stage & gate new product development process with StageTrak will help you deliver the best new products in the shortest time-frame. Save valuable time converting approved ideas into stage & gate projects; all approved idea information, drawings, attachments, descriptions, analysis information, etc… are instantly converted to StageTrak for time-saving project setup. Accelerate set-up time—your stage & gate process templates are easily applied to each project at project inception. Customized to your stage & gate new product development process with your documents, deliverables and analysis criteria. You are not reinventing the wheel, you are making it better and faster! Transform your existing new product development spreadsheets into a collaborative project and portfolio management system. Expedite tasks with automatic alerts and e-mails. Easy access to all project documents, deliverables and analysis forms organized on one project dashboard. Instant visibility into the progress and value of your New Product Development project pipeline with portfolio and progress reports. View and compare key decision points from selected projects on portfolio reports for faster and more accurate decision making. Track your projects and tasks from your own personal “My Projects” Dashboard. Collaborate with all team members and assign new tasks as the need arises. 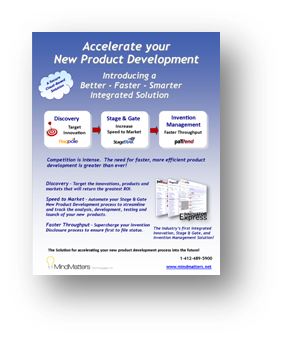 Are you lacking an effective stage & gate new product development process? We can help! Our team of experts can help you create and implement a stage & gate process designed specifically for your business. We also offer new product development process templates that can be easily modified for your business. The information above covers only a portion of the many ways INNOVATOR NPD Express can automate, accelerate and increase the ROI of your new product development program. 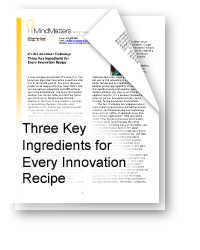 The best way to gain a complete understanding of how INNOVATOR NPD Express and the experts at MindMatters Solutions can help your business is to contact us to begin a discussion of your innovation and new product development needs and requirements.